Used with permission from PrecisionAg.com. Falcon Soil Technology has added two models to its lineup of automated soil sampling systems that promise to bring precision accuracy to a critical task now dominated by error-prone hand sampling. The new models were introduced at the annual MAGIE (Midwest Ag Industries Exposition) Show Aug. 26-27 in Bloomington, Ill.
“Unlike traditional hand sampling used on most farms, the Falcon is designed to quickly collect high-quality samples with precision, consistency, repeatability and efficiency,” says Allan Baucom. The North Carolina farmer developed Falcon over frustration with the inherent inaccuracy of traditional sampling methods. The Model 1000 builds on the success of the 2014 Falcon, with an improved drum and funnel assembly for better soil mixing and sample integrity. An upgraded video camera enhances machine monitoring and a redesigned layout improves balance, aerodynamics and ergonomics. The system also has an all-new electronics control panel. The Model 1000 includes an on-board computer with a remote, easy-to-use operator interface for control from the cab. The Falcon ServiceLink system supports remote diagnostics and software upgrades, plus a high-visibility caution light to quickly alert the operator if there is a malfunction. The Model 5000 adds a dedicated GPS receiver to track sample routes and individual core locations, a barcode reader for sample integration with GPS locations, plus cloud-based data integration with soil test laboratories and precision ag software, which is in prelaunch testing. In addition to all Model 1000 features, it also comes with an enhanced power/electronics/light package (optional on the Model 1000) that includes a trickle charger, external PC ports and improved lighting. The Falcon overcomes hand-sampling inaccuracy with a heavy, narrow 5-foot-diameter stainless steel drum mounted on a trailer. A probe on the drum’s circumference punches out an equal-depth sample with each drum revolution as the machine is pulled across the field. 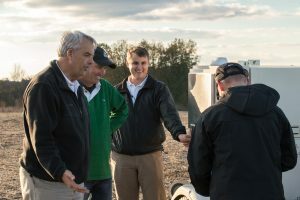 “While based on a simple wheel, the Falcon incorporates GPS, a modern computer interface and cloud communications technology for durability in the field and streamlined operation and data management needed for precision agriculture,” says Baucom.